Red Hat Enterprise Linux (RHEL) version 6.3 became generally available today, ushering in a new era of virtualization scalability. The RHEL 6.3 update is the third major update to Red Hat’s flagship platform since RHEL 6 was initially introduced in 2010. Red Hat is following up its first billion dollar year with a strong first quarter of growth. For Red Hat’s first quarter fiscal 2013, revenue was $314.7 million, a 19 percent year-over-year gain. The bulk of that revenue came from Red Hat’s software subscriptions, which came in at $272.6 million, a 21 percent gain. Net Income was $35.7 million, or $0.19 per share, which is a gain over the $32.5 million reported a year ago. Red Hat CFO Charlie Peters explained during the company’s earning call that earnings for the first quarter were negatively impacted by a $3.1 million charge related to Red Hat moving out of one of its existing buildings in Raleigh, North Carolina. Summary: Just as surely as Microsoft rules the desktop with Windows and Apple rules tablets with the iPad so Linux rules supercomputers of every type and sort. Once more, Linux kicks rumps and takes names when it comes to supercomputers. A few decades back I was working at Goddard Space Flight Center. I’m sorry to say that I left just before some people I’d met, Don Becker and Thomas Sterling, built the first Linux cluster, Beowulf. They didn’t know it, but by making a cheap cluster from 16 486DXs processors and 10Mbps Ethernet, they were creating the ancestor to today’s Linux supercomputers. 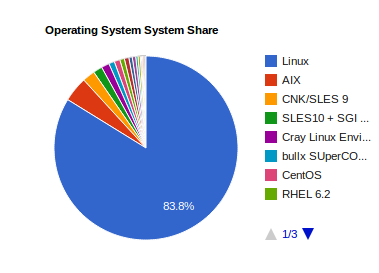 Now, not 20 years later, well over 90% of the world top 500 supercomputers are running Linux. America may be the land of spacious skies and amber waves of grain, but what it doesn’t have is major retail stores selling PCs with Linux preloaded. To get those, you need to move to the “developing” world, as Canonical highlighted most recently with plans to sell Ubuntu computers built by Dell in India. Now, the question is: Will this trend ever take off elsewhere on the planet? Of course, as attentive observers of the open source channel will note, the deal involving Ubuntu PCs in India isn’t totally novel. Canonical began pursuing retail outlets as a vector for Ubuntu PC sales in earnest last fall, with a similar partnership launched with Dell in China in October 2011. Around the same time, Asus Ubuntu machines became available at retail outlets in Portugal.